April brings not only spring showers, but the arrival of National Poetry Month. In hopes that everyone will pause to smell the flowers and to indulge in some poetry and prose, we have put together a wonderful collection of poetry for children at Interabang Books. Highlighted here today is one of our favorites author and poets, Joyce Sidman. Joyce Sidman says that she believes wholeheartedly in “Pondering Time” - time alone without noise and distraction, and loves nature and walks in the woods. This comes across in her poetry, as much of it explores the beauty of noticing the small details and wonder found all around us. She spends many hours walking near her home in Wayzata, Minnesota where she also loves to dig in the dirt and eat chocolate (but not together). Like a cherry into my ear. Joyce Sidman has said that she has written over 100 books in whole or part), but that there are just 16 currently published. Here are some of our favorites. 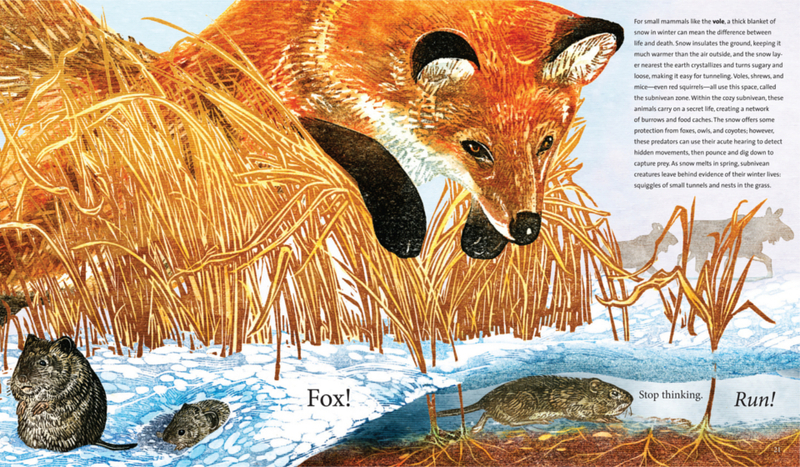 Color comes alive throughout the seasons in the whimsical poetry and adorable illustrations of this Caldecott award winner. This is such a gorgeous book, with perfect text that reads like a song atop beautiful scratchboard art. The message about slowing down to enjoy a beautiful snowy day is one we all long for. A shape that is found over and over in nature, Sidman finds the extraordinary beauty of a swirl beautiful and mysterious, and draws inspiration to create verse to accompany amazing illustrations of swirls all around us.